A driver had to be cut out of his lorry with severe injuries after his vehicle overturned on the motorway – and filled the road with beer. Thousands of cans of beer spilled across a slip road after the massive lorry crashed and flipped on its side. The incident closed the M2 sliprad near Sittingbourne, Kent, on Thursday morning. Firefighters used heavy rescue equipment to free the driver, who sustained a “very serious” arm injury and was taken to hospital. Police claimed the driver may have been driving for 11 hours straight at the time of the accident. 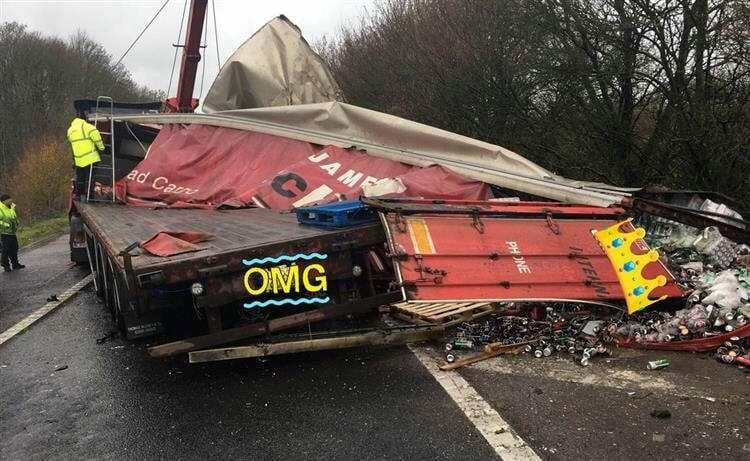 They believe the lorry had disconnected brakes, exposed cords, and worn tires. Emergency services were still clearing up the scene ten hours after the accident. A spokesman for Kent Police said: “We’ve had to close the exit slip road of the M2 at junction 5, London-bound, due to an overturned lorry. “The incident was reported to us at 5.46am on November 29. “Officers attended alongside crews from Kent Fire and Rescue Service, the South East Coast Ambulance Service and the Kent, Surrey and Sussex Air Ambulance. “A man has since been taken to a London hospital for treatment to an arm injury. “His injury is very serious.